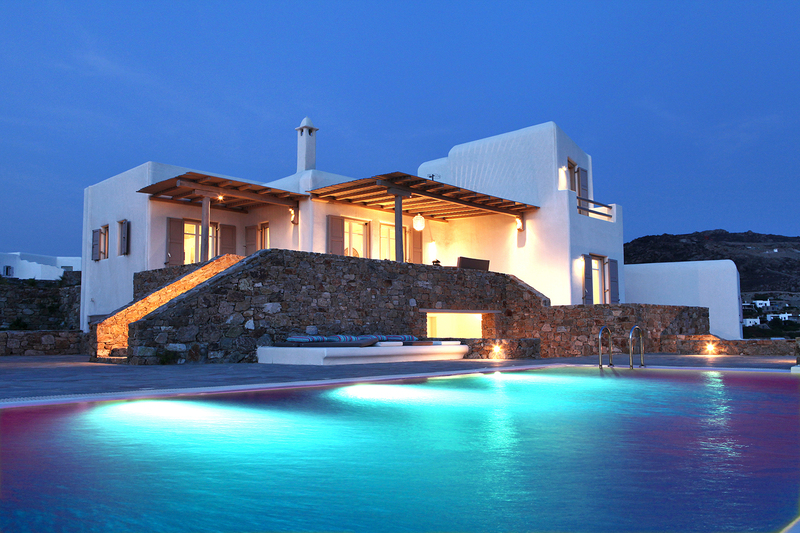 In the most privileged location of Elia in Mykonos is situated a contemporary summer vacation villa, with fantastic where white color, stone and water are the dominant characteristics. The white minimal interior of the house with smooth curved edges and simple deco gives you a relaxing ambience and enjoyable atmosphere. Villa Elzi is spread in 3 levels. On the upper level is the living area, bathroom and a full equipped kitchen while on the top of the upper level there is the boat like bedroom with king size bed and private bathroom with sea and water views from everywhere. It is like being on a floating boat. The 6 bathrooms are made of polished cement with smooth curves and light colors. The villa is strategically located above Elia beach and Agrari and you can watch both beaches from every corner of the house. The infinity pool is situated in a location where the pool water view dives in the blue of the sea. Water flows from every point of view of the villa. The symphony of colors of the sea and the sky changes during the day and comes to its peak sunset time. There is a built table under a shaded pergola suitable for epicurean meals or relaxing moments. There is also a barbeque and an external bar on the pool area. The size of the pool area easily holds events up to 150 persons.